Hold on to your breath, there is too much wilderness ahead! 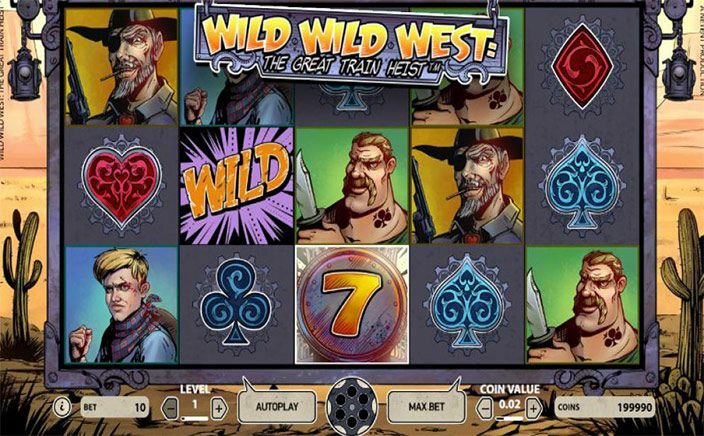 Wild Wild West: The Great Train Heist slots, a game which itself states Wild twice, has a lot to offer. This slot by NetEnt is highly entertaining and offers some great features. With a comic-style theme and graphics to die for, Wild Wild West: The Great Train Heist slots is just what you need to get your game on! NetEnt is one of the most reputable slot developing companies in the online world. Whichever slot comes from the house of NetEnt, has to be among the best. From top class graphics to unique features, every NetEnt slot is to look out for. The story that backs up Wild Wild West: The Great Train Heist slots is that of a train robbery involving four villains. Coming from the house of NetEnt, this slot undoubtedly has excellent graphics that define the theme perfectly along with entertaining animations. Spinning on the 5 reels and 10 paylines are symbols depicting the four villains, from which the female one has the highest value. Other symbols seen are the regular slot symbols from the card deck and diamonds. The Wild symbol offers 50 times your bet when you get 5 of them in a payline. Then there are some interesting bonus features. The first one is the Pick and Click feature which is activated when you land on three safe bonus symbols on first, third and fifth reel altogether. Here, the player will have to pick a bonus symbol to reveal the prize they will get, which is a cash prize ranging from 5 to 50 times. Then there are the free spins, which are activated on getting 3 or more scatter symbols. A player can get 10 to 30 free spins, which depends upon the number of scatter symbols they hit. There are 4 wild symbols that can make you rich in this slot. Regular wild, 2x Multiplier wild, Expanding wild, and Spreading wild are the four types of wild symbols. These symbols come into the picture just before the free spins. There will appear a Wild Selector Wheel which will start spinning and the player needs to stop it, wherever the wheel stops, that wild feature is activated. 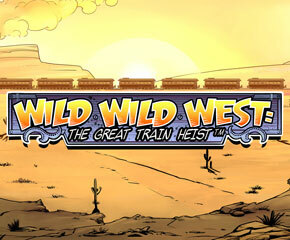 So, are you wild enough to handle the wilderness of Wild Wild West: The Great Train Heist slots? The slot has a lot to offer if you play it the right way. For 10p a spin, this slot is worth every penny you spend on it. Start spinning now and get the wilds going!